One of the most important things in life is love. When you’re in an intimate, passionate, connected relationship and you anticipate your partner’s needs, it’s an experience of pure ecstasy and joy – but it’s an experience that many people never get to enjoy. How is it that so many people are looking for love, but are unable to build lasting, meaningful romantic relationships? We often ask ourselves why relationships fail. We tell ourselves “It’s just fate” or “It wasn’t meant to be,” trying to absolve ourselves of all responsibility. The truth is, the success of your relationship is entirely within your control. Many of us get caught up in the game of relationship roulette, hoping for the best but leaving the success of the relationship up to chance. This won’t get you anywhere. No matter how close you are to your partner, the only person you can change in a relationship is yourself. To experience real, lasting love, you have to take control of your union and make it the happy connection you want it to be. So why do relationships fail and how can you prime yourself for a better chance at success? There are some powerful statistics out there regarding the success and failures of relationships. Did you know the divorce rate for first marriages is 41-51%? 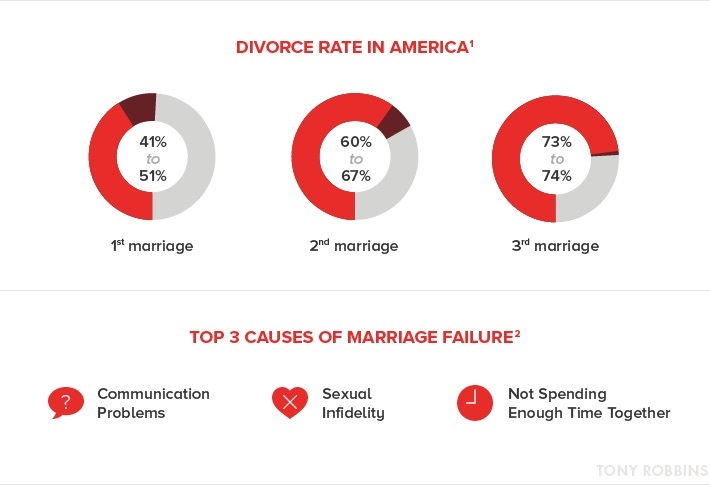 Are you aware of the top three causes of marriage failure? Read on to discover more about what causes relationships to break down and how you can save yours. What brings people together? What are some reasons relationships fail? A couple that was deeply, passionately in love can find themselves feeling alone, trapped and misunderstood within a matter of just a few years. A primary stressor on any romantic relationship is that falling in love, however wonderful, is often synonymous with a loss of freedom and passion. This can eat away at a couple, leading them to see each other as adversaries and jailers rather than equal partners and lovers. What if instead of looking at the individual liberties lost during a relationship, you focused on all the things you’re gaining by being with your partner? 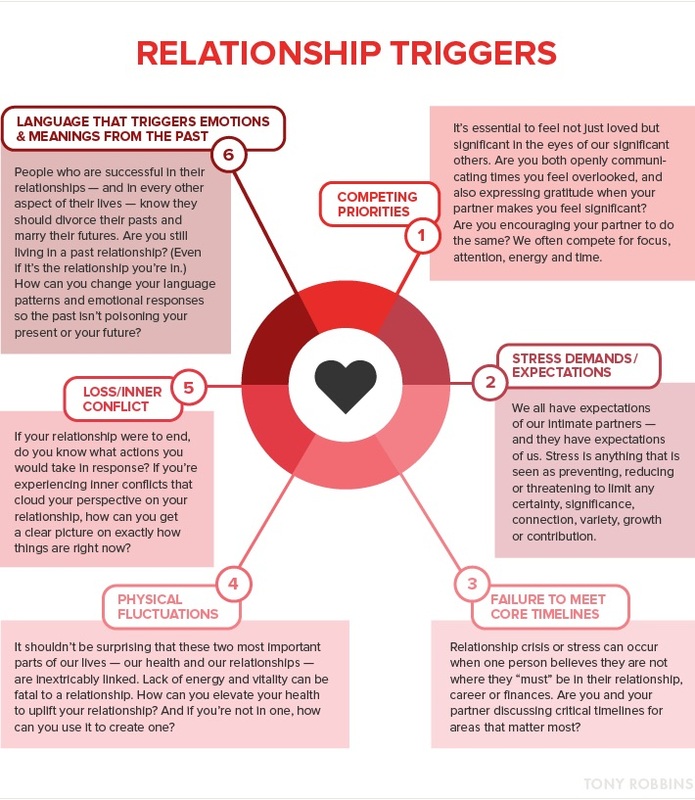 Any one of these triggers can put stress on your relationship. Two or more can make those in the relationship wonder why they’re sticking around and whether the grass might not be greener with someone else – or even alone. None of the aforementioned triggers needs to be fatal to your relationship. The key to maintaining a happy, healthy partnership is to treat your partner with compassion in times of happiness and in stress. As you do this, you’ll gain clarity about these triggers and the needs of your partner, some of which you may have ignored or simply been oblivious to. Open up the lines of communication and share your uncertainties and concerns with your partner. As you open up to them, they’ll return the favor. No relationship is perfect. Every couple has ups and downs, but when you’re truly ready to commit to your partner, there are strategies to help you make your relationship the strongest it can be. 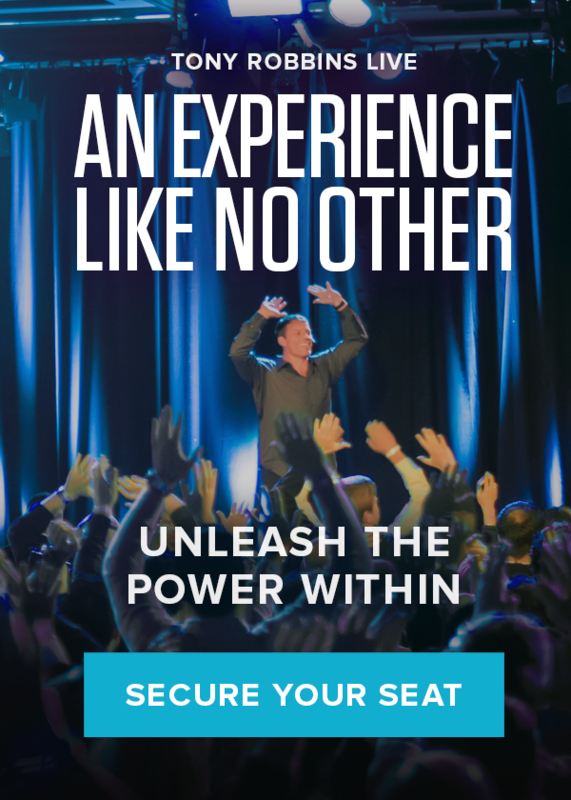 At Unleash the Power Within, you’ll assess the current state of your relationship and identify what’s causing it to feel stagnant. Then, you’ll learn effective ways to put the spark back in your relationship. Whether you attend alone or with your partner, you’ll learn about the power of polarity and how it affects your relationship. The multi-day event will make you recognize that something as important as your romantic relationship shouldn’t be left to chance, like a game of roulette. Your actions within your relationship should be thoughtful and intentional to ensure your relationship is a healthy, joyful one. Identify what you want from a romantic partner and learn how to create a loving, passionate relationship at Unleash the Power Within.